BAC (Bronchioloalveolar cancer) has sometimes been called the “mystery” lung cancer. Accounting for 2% to 14% of all lung cancers, less is known about this type of cancer than other non-small cell lung cancers. The World Health Organization has classified BAC as a type of adenocarcinoma, a form of lung cancer that is more common in non-smokers. Adenocarcinoma is the most common form of lung cancer found in women, and is often found in non-smokers. It is also the most common type of lung cancer in people under the age of 45 and the most common type of lung cancer among all Asians. One subtype, bronchioloalveolar carcinoma (BAC), appears to be increasing in young, non-smoking women. It develops in cells near in the small air sacs (alveoli) in the outer regions of the lungs and spreads either along the tissue that separates the alveoli, or through the airways. Unlike other forms of lung cancer that often spread to the lining of the lungs (the pleura), and other regions of the body, BAC spreads primarily within the lungs. 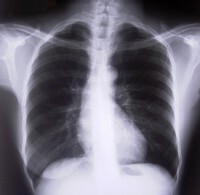 It can appear as a single spot in the periphery of the lungs, or as scattered spots throughout the lungs. There are 2 main types of BAC: non-mucinous BAC is more common, and found more often in smokers, and mucinous BAC, which is less common and often found in non-smokers. BAC is more likely to affect non-smokers, women, and Asians (especially eastern Asians) than other forms of lung cancer. Its incidence appears to be increasing, especially among younger non-smoking women. Lung adenocarcinomas usually begin in tissues that lie near the outer parts of the lungs, and may be present for a long time before they cause symptoms and are diagnosed. Sometimes there can be no signs or symptoms in the early stages, however, symptoms develop as the disease progresses. Exposure to radon in the home is the second-leading cause of lung cancer and the leading cause in non-smokers. Radon is a radioactive gas that is produced by the natural decay of uranium in the soil. It can enter homes through cracks in the foundation, around sump pumps and drains and through gaps around pipes and wires. Having been found in homes in all 50 states, the only way to know if you are safe is to test for radon. Simple do-it-yourself test kits are available at most hardware stores. Exposure to asbestos is ordinarily considered an occupational exposure, but working with asbestos insulation in older homes (those built prior to 1970) can result in exposure too. Asbestos is responsible for roughly 84% of cases of mesothelioma, a cancer involving the lining of the lungs. Left alone, asbestos poses little danger, but exposure can result if it is disturbed. If you choose to remodel a home that may contain asbestos insulation, hire a certified contractor. Air pollution has been looked at as a possible risk factor for lung cancer, because there is a significant difference between the incidence of lung cancer in urban and rural areas, with lung cancer being more prevalent in urban areas. It is uncertain to what degree air pollution contributes to lung cancer in the United States, but according to the largest study to date, more than 10% of lung cancers in Europe may be secondary to air pollution. As with asbestos, most exposures to cancer-causing chemicals occur in the workplace. Certain products used in the home, such as some wood strippers, contain chemicals that are associated with an increased risk of lung cancer. It is important to read labels on any of these products and take appropriate precautions as directed on the packaging. Exposure to medical radiation to the chest for other cancers, for example Hodgkin’s lymphoma or breast cancer, can increase the risk of lung cancer, although the benefits of treatment usually far outweigh this risk. In Japan, exposure to atomic bomb radiation was associated with an elevated risk of developing lung cancer. Second-hand smoke increases the risk of lung cancer in an exposed nonsmoker two- to- three-fold times. It is currently felt to be responsible for 1.6% of lung cancers in the United States. Occupation as a cause of lung cancer is common. It has been estimated that 13 to 29% of lung cancers in men are secondary to on-the-job exposure to chemicals and materials that increase the risk of lung cancer. Many of these exposures are preventable through awareness, and taking appropriate precautions. How Do I Know if Exposures at Work Can Raise My Risk? Employers are required to provide Material Safety Data Sheets (MSDS’s) on chemicals you may be exposed to at the workplace. It is important to take the time to read these, and follow any safety recommendations that are suggested. That said, only 2% of chemicals used in commerce have been studied for carcinogenicity, that is their ability to cause cancer in humans. Though this is concerning, taking basic precautions could likely lower your risk considerably. When around chemicals, wearing gloves, ensuring proper ventilation, and using an appropriate mask are paramount. It is important to note that not all masks are created equally. Some exposures may be prevented with a simple dust mask, whereas others may require the use of a respirator to prevent a potentially toxic exposure. The following lists of substances and occupations that could place you at risk is far from exhaustive, but provides an overview of some of the more common exposures that are linked with lung cancer. Having a first-degree family member (parent, sibling or child) with lung cancer roughly doubles the risk of developing lung cancer. This risk is more for women and less for men and stronger in non-smokers than smokers. Having a second-degree relative (an aunt, uncle, niece or nephew) with lung cancer raises your risk by around 30%. Smokers who develop lung cancer are less likely to have a family history than nonsmokers that develop lung cancer. That said, however, for those who have a genetic predisposition to lung cancer, smoking appears to amplify that risk. Studies vary in the types of lung cancers that have the greatest hereditary component, but those with nonsmall cell lung cancers, especially lung adenocarcinoma are more likely to have a family history of lung cancer than those with small cell lung cancers. A recent finding is that non-smokers with non-small cell lung cancer whose tumors have an EGFR mutation are much more likely to have a family history of lung cancer than those who have an ALK or KRAS mutation. Blacks with first-degree relatives have a greater risk of early onset lung cancer than whites. This risk increases in smokers. In general, having a family history of cancers other than lung cancer, does not appear to increase the risk that you will develop lung cancer. On the other side of the equation, though, those that develop more than one primary lung cancer are significantly more likely to have a genetic predisposition contributing to their cancer.